Happy 2015, gardeners, and welcome to the first Nadja’s Garden newsletter. Are you, like me, still bracing for the real summer heat to hit our gardens? So far this summer has brought a welcome holiday break to our family, a chance for some leisurely garden reading and the usual bounty of sweet and fragrant fruits. At our place it’s apricots, mulberries and white peaches in December, yellow peaches, plums and nectarines in January, and grapes sprinkled throughout. All topped off with the vibrant colours and raucous screeching of marauding lorikeets as we scramble to net everything before they devour it! This summer our vertical garden, shaded by a pergola and automatically watered more frequently than the rest of the garden, has grown into a lush little oasis – and a handy spot for propagating cuttings. My resolution for this year is to put aside enough time to really enjoy my own garden and to give it more of the care it deserves. I look forward to hearing from you this year, whether you’re just starting out with kitchen gardening or fully cranking…we all have so much to learn and share and there are so many enjoyable ways to do it! Please feel free to contact me with your feedback on the newsletter, and to forward it to friends or invite them to join the mailing list. 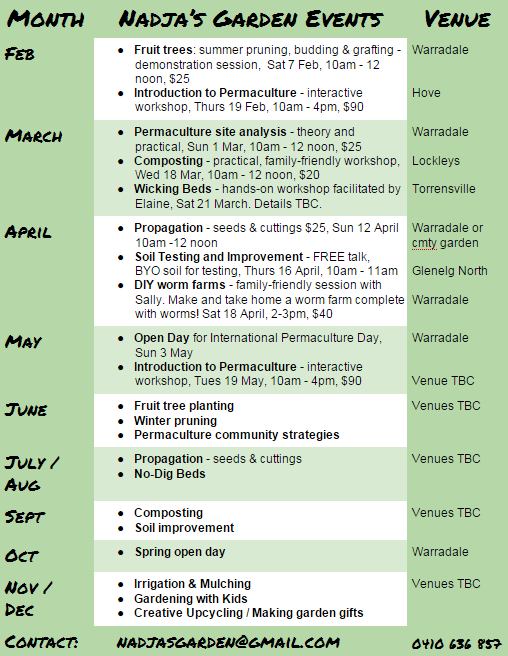 This year is going to be chockers with gardening and permaculture education – see the Events calendar above. Bookings are welcome now for all events with dates listed, and you can register interest in attending or even hosting the events that fall later in the year. Please book early as numbers are limited, and note that all proposed events are subject to change. Workshops are also available for schools, community gardens and centres, or a group of friends at your home. Please email nadjasgarden@gmail.com or phone 0410 636 857 to book or discuss. Nadja’s Garden stall pops up every second Thursday at the weekly Organic Corner Store market, Glenelg North. December sadly saw the closure of the Bellevue Heights market, but I look forward to keeping in touch with the many lovely people who visited there. The new Adelaide Gardening Calendar was very popular as a Christmas gift and is currently out of stock until I print up a new batch. This autumn will also see the arrival of ready-to-pick salad boxes and worm farms made with recycled materials – orders are welcome. Market members receive discounts on many products and even on garden consultations so remember to flash your membership card! There is also a community garden located just behind the market, with friendly volunteers who operate a produce swap table at the market every week. Anyone is welcome to bring along garden surplus to share, and to take something you can use from the swap table. The Organic Corner Store market is located in the Glenelg North Community Centre, at the corner of Kibby and Alison Ave, every Thursday from 9-1. Our next stall dates will be Jan 29 and Feb 12. Please email if you wish to order particular items. Nadja’s Garden fruit (peaches and nectarines) will also be on sale at the OCS stall in the market hall this Thursday, Jan 22. The year has already kicked off with a flurry of consultation bookings. Spots are now available from the week beginning Feb 9. An edible garden consultation is typically 1.5-2 hours, costs $55/hr, and can include advice on where to grow your fruit trees, herbs and vegetables; how to improve your soil; how to get started; problem-solving etc. Email nadjasgarden@gmail.com or phone Nadja on 0410 636 857 to book an appointment. You will receive a questionnaire to complete prior to your session so you get maximum value from the consultation time. My permaculture-based designs focus on taking your vision and dreams for your garden and turning them into manageable steps, with clear plans, planting lists, seasonal schedules, illustrations and fact sheets. They represent incredible value, priced from $250 (average $350 for a suburban family backyard combining productivity and play space) and even include follow-up support by phone or email while you are implementing your design. Pop into the market to browse through a range of designs, or see samples at your consultation. “We just wanted to email you to say thank you so much for your fantastic plan for our garden in Fullarton. It’s a brilliant plan, and really captures our ideas for the garden. We especially appreciated the extensive detail in the plan, with resources and guides. The seasonal “worklist” schedule has been invaluable, as have the suggestions for soil improvement and planting guides. Your suggestions for things we hadn’t thought of like rainwater tanks and a woodfired oven have become big features of the design, and added real excitement to our plans” – James & Jessica. The Sampson Flat bushfires this month came closer to home than expected, as much of the landscape of my high school years, apparently including our old farm, was burnt out. I am keen to support landowners during the recovery phase and would like to offer a free consultation each month of 2015 for people setting up or re-establishing edible gardens in bushfire-affected areas around Adelaide. If you know someone in this situation, please pass on this offer to them. http://www.sgaonline.org.au/738/ – Gardening After Bushfires article. This entry was posted in community, courses, events, Family, fruit, hanging out in the garden, markets, permaculture design, permaculture principles, planting, propagating, resilient gardening, seeds, soil, summer, sustainable food, time management, vegetables. Bookmark the permalink.